So you want to make your apartment smart, but you don’t know how or where to start. Good news, you’re in the right place. From high-tech smart home options to simple changes, the options are overwhelming. Our tech experts looked at every option and came up with four tips for you — the renter. With little-to-no installation, you can make your apartment smart. The best part? When you move out, these devices are coming with you. 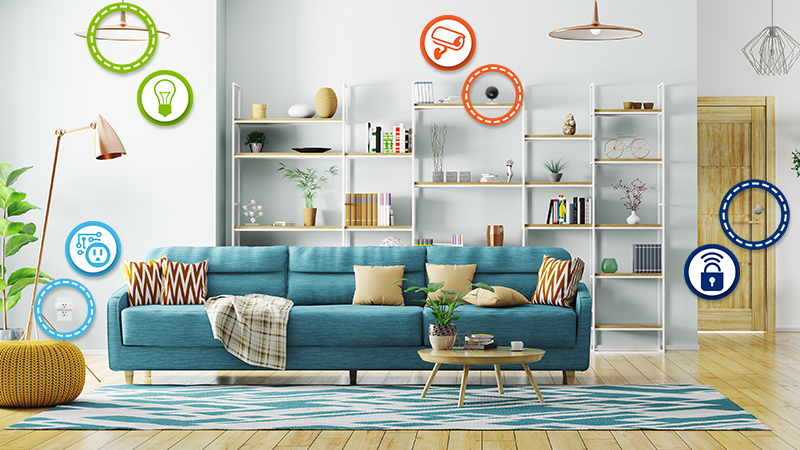 First thing’s first: Get your smartphone or smart speaker (like Amazon Alexa, Google Home Assistant or Apple Homekit with Siri) ready to sync to your smart home devices and let the tech magic begin. Wireless lighting systems like Philips Hue work well for rental properties. Dim the lights or change the color all from your smartphone or smart speaker. Just switch out the bulbs, no wiring required. Coming home late? Walk in to a lit house without leaving your lights on all day – turn them on from your phone before you walk in. Smart locks may seem like an impossible option for renters, but not so fast! Not every smart lock requires replacing the entire lock. Put your landlord’s mind at ease with locks like the August Smart Lock Pro. They don’t require you to replace the entire locking mechanism, just the knob on the interior side of the door. Translation: The original keys will still work, it is completely reversible and will be more likely to be accepted by building management. Pro tip: Get your landlord’s permission first. Once you get the go-ahead, enjoy keyless entry, automatic locking and complete control to lock, unlock and monitor from anywhere. A smart plug is the easiest way to start the transition to a smart home. You simply plug it in to any wall socket, then plug in any device. You’re in control. For example, plug in a lamp and you can turn it on or off no matter where you are from your phone. You can even set a schedule for the devices to power on and off. Gone are the days of you walking out the door with that pesky coffee maker still on! When looking for smart plugs, find one that easily interacts with products you already have (i.e. smart speaker). Good news, security cameras like Nest, Canary or Netgear’s Arlo will all work in a rental. No installation required. Put it where you want it, connect to the internet and that’s it. Sync it up to the app on your smartphone and your worries will fade. Watch live video of your apartment from the HD camera, sound the alarm, or call the police all from your phone. Congratulations, your apartment just got a little smarter. Need help explaining why you want a smart apartment to your landlord? Our tech expertsare here to help! They can teach you every benefit so you’re confident in your pitch to property management.